Yesterday we posted about the cool new game, Lords and Ladies. Today we thought we might tell you where we fist heard about the game -- in the pages of Paprika Southern. Paprika Southern is a digital magazine originating in Savannah, Georgia. Programs like issuu have made it possible for anyone to be their own digital publisher, much like the Polaroid camera made everyone a photographer. If you have ever seen old Polaroids, you know that just because you can take a picture, doesn't mean you should. All of you creative types out there probably have at least one good magazine in you. But publishing a magazine is hard work. Doing it on a consistent basis and doing it well is tough. After one or two sporadic issues, most would-be publishers abandon the idea. Paprika Southern just published their fifth issue and it looks like nothing will be stopping them. In the 1950's savvy young women intent on publishing took the bus to New York City, stayed at the Barbizon and wore gloves to work. Ten years ago, savvy young women flew to New York City, found a third floor walk-up in Chelsea and wore flip-flops to work. Now days, savvy young women can find a place they love, live in affordable housing, and start their own magazines in their pajamas if they are so inclined. Sharing a third floor walk-up in New York City, Siobhan Egan and Bevin Valentine would probably be getting coffee for a senior editor, or running errands, or supervising an occasional photo shoot. Instead, they are producing a lifestyle magazine with a Southern flair that is regional without being provincial. 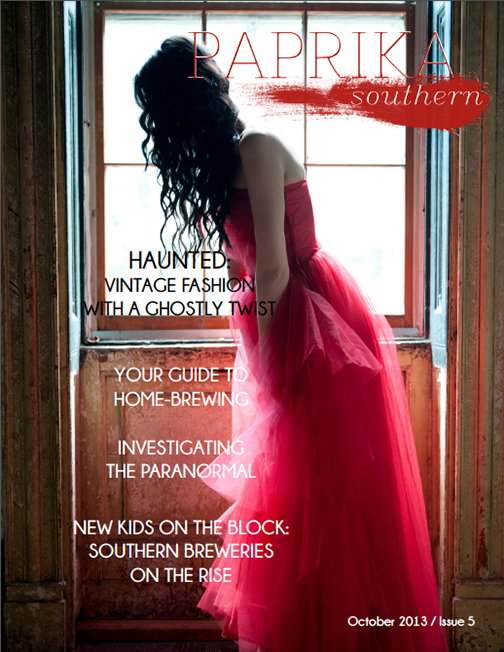 Seamlessly integrated in the pages of Paprika Southern the reader will find fashion and farming, beer and opera, art and commerce, and much more. You will be missing out if you don't take a look at Paprika Southern. PS: If there is a problem it lies with issuu which is rather slow at loading the pages. This had always been an issue with issuu, so don't let this slow you down.